Hello! Are you guys excited for 2013? I sure am! 2013 is the year in which I will graduate from high school and head off to college (hopefully in Philadelphia). My sister posed for a few photos with me this morning. Actually, we took more than just a few photos. 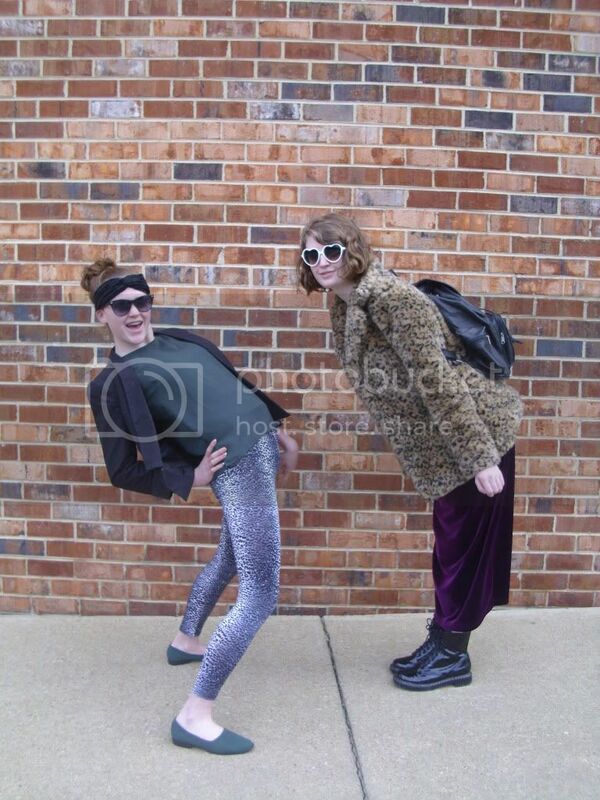 I believe that about 100 photos were taken and about 30 turned out well. 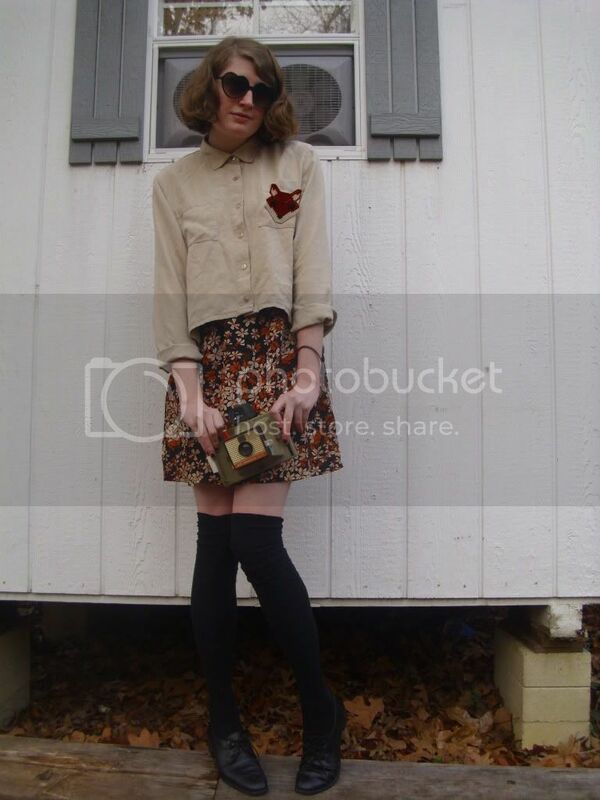 However, I am not going to post them all on my blog because that would be photo overload. 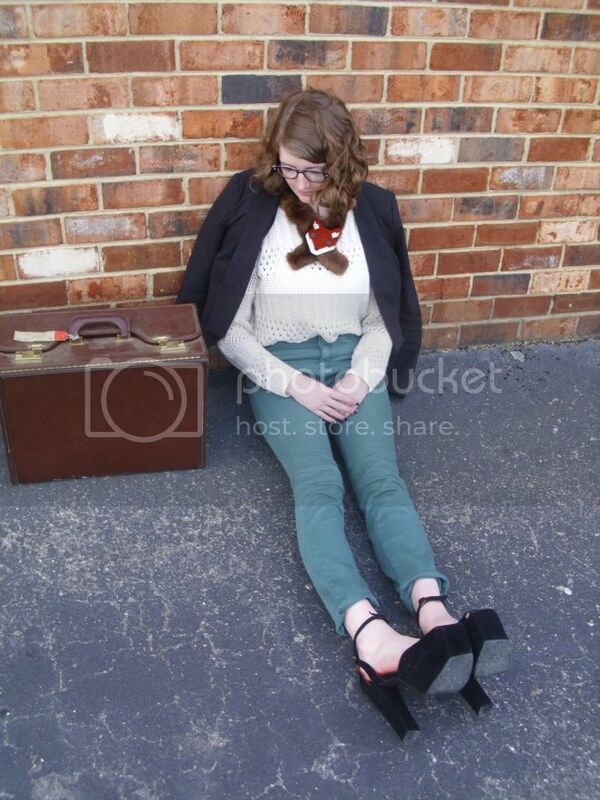 If you are friends with me on facebook, you can see all of the photos that turned out well. For my look, I started with this deep purple, velvet dress. Vintage velvet absolutely makes me swoon! It is such a glamorous fabric. 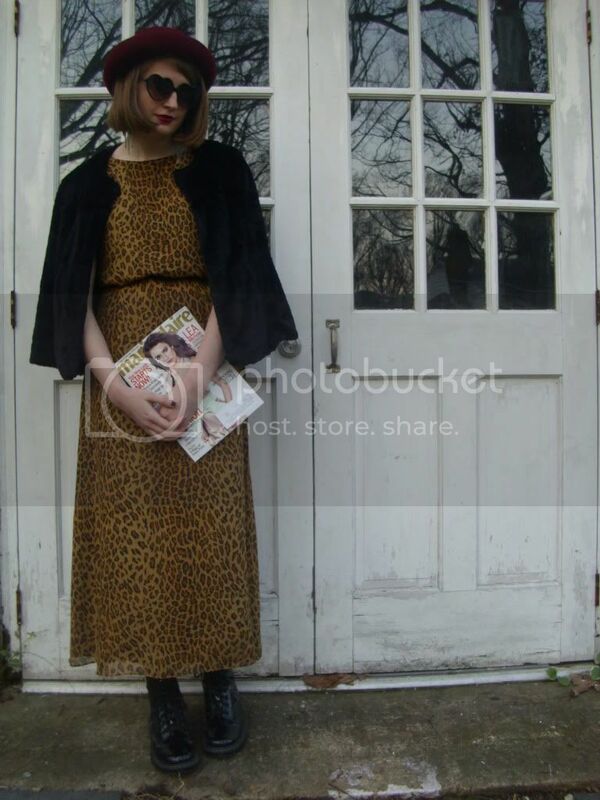 To add to the glamour of the dress, I slipped into my faux fur leopard print coat. 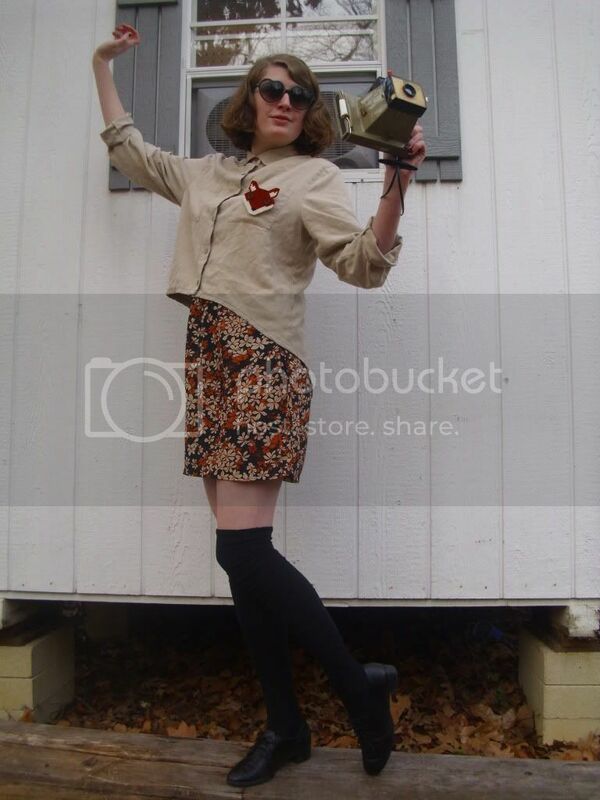 A rhinestone collar and heart sunglasses accessorized the look. 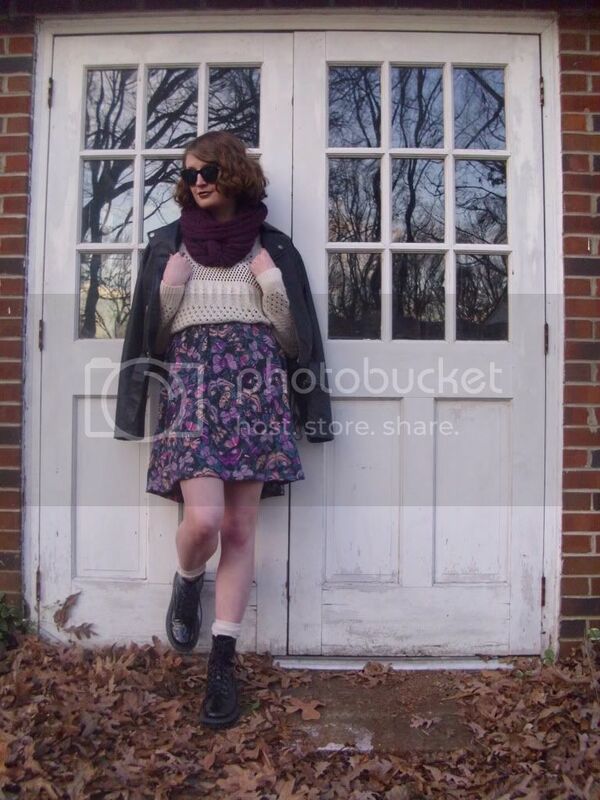 To keep the look from being too fancy, I decked my feet out in a pair of edgy, combat boots. 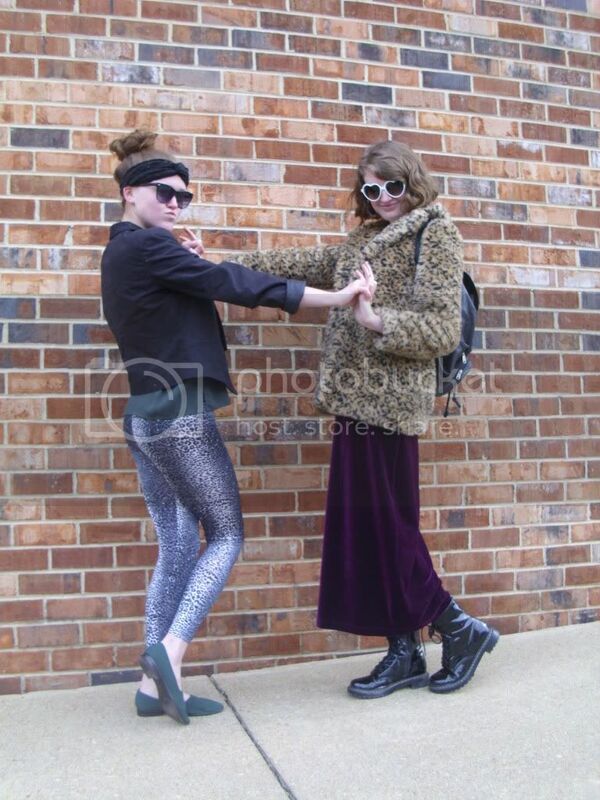 I styled not only my look today but Missi's look also.When styling Missi's look, I wanted hers to go with my look so I picked out a pair of leopard print leggings for her to wear. These leggings were a recent gift from my Aunt Nancy and Uncle Gil. Thanks, again! 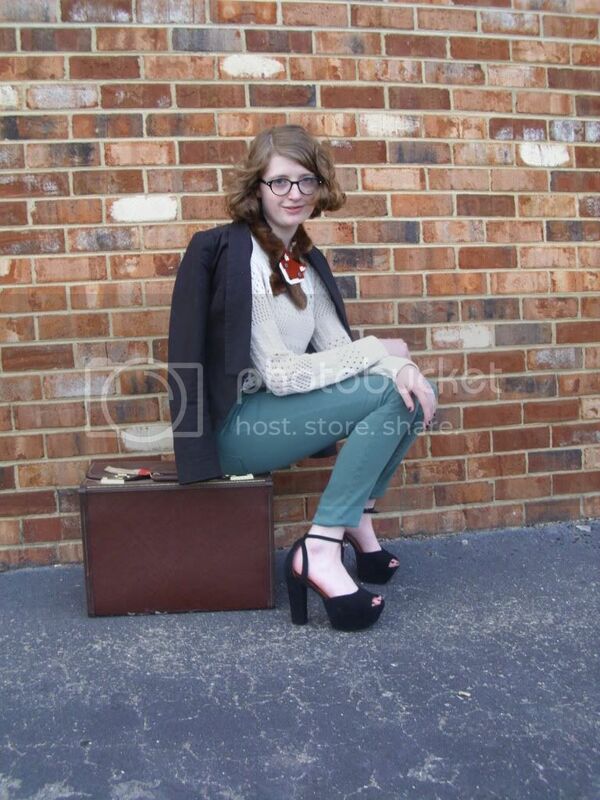 I styled a forest green blouse with the leggings and had Missi throw on a black blazer to keep warm. Missi adorned her head with a DIY turban headband. 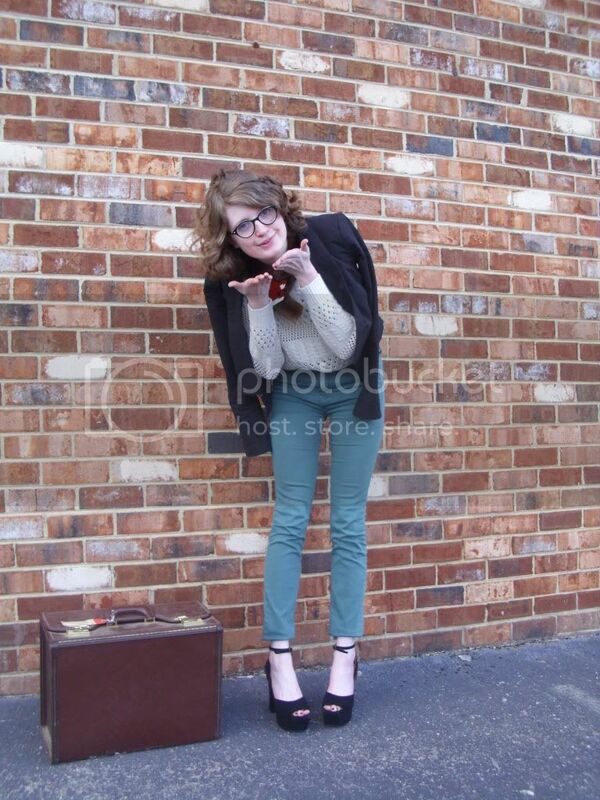 Her feet were cozied up in a pair of green flats. 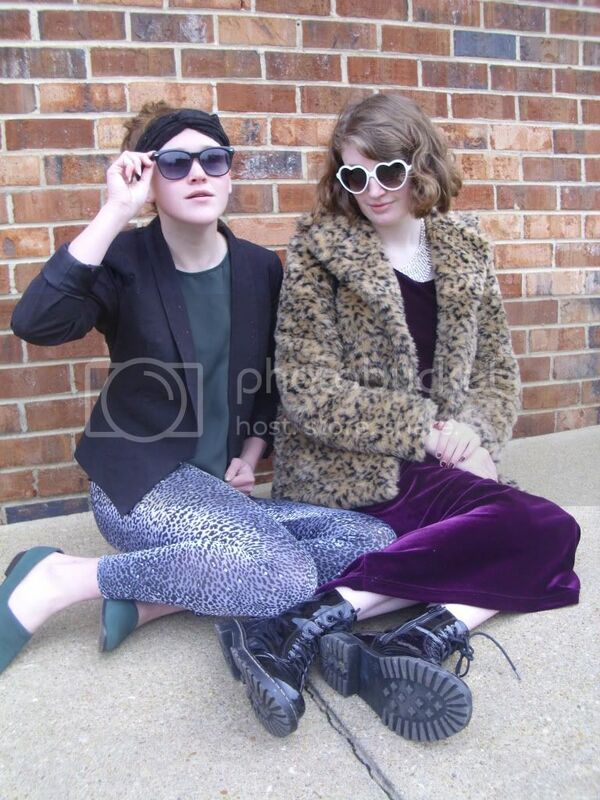 The look was perfected with a pair of over-sized Giant Vintage sunglasses. Hope that all of your dreams, hopes and wishes come true in 2013 and that you enjoy yourself tonight! Hello! 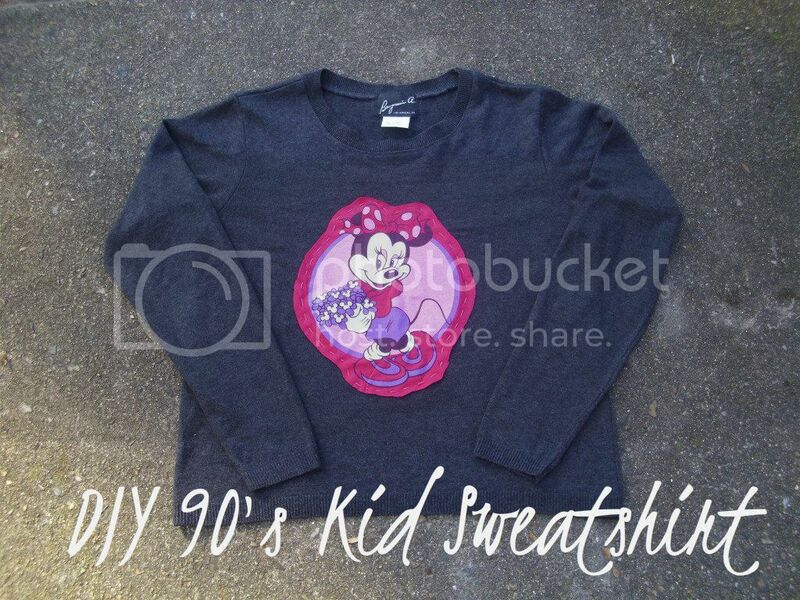 Today, I have a fun DIY for you- a DIY 90's kid sweatshirt. Oh the nostalgia for the 90's! Disney characters, troll dolls, beanie babies, pogs, Lisa Frank and Guess Who all dominated my childhood. Tumblr users label kids born in the nineties as the last generation who truly had a childhood. Now, kids play on their iPhones and rarely play board games. Anyway, this DIY will bring you back to the 90's; enjoy! Level of difficulty: Easy to medium difficulty. You must be able to hand sew. Cost: Less than $5. Thrift a sweater for a dollar or two (mine only cost $1- score!) 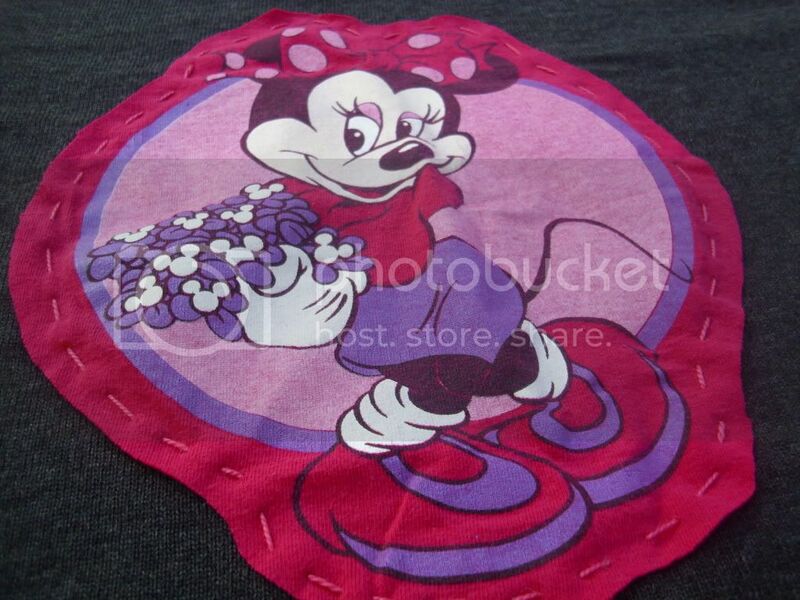 to use for this DIY and use an old tee shirt (mine had an image of Minnie Mouse on it) from when you were a kid. Most likely you have scissors, pins, thread and a needle lying around somewhere so that shouldn't cost you any money. Time: This DIY will take you somewhere between 15 minutes and 30 minutes depending on your DIY skills. 2. Cut out character or motif from old tee shirt. Leave a border along the piece. 3. Pin that piece down to the sweater/ sweatshirt. 5. Sew the piece down. I hand sewed mine with embroidery floss because I liked the homemade vibe but you can hand sew yours with normal thread or use a sewing machine for an even more finished appearance. Hello! Oh, how I wish I was French. The cuisine, the fashion, the language... all trés perfect. Hopefully, I will be able to enroll in a class next year where I can learn to speak French. Sadly, my language skills are very poor. The only French words I know are "bonjour" and " trés (chic)". For four years, I took lessons in Spanish but hardly remember a thing that I was taught. Looking back on it, I wish that I had taken French. After all, I dream of traveling to and perhaps residing in France when I'm older. But enough of my ramblings. 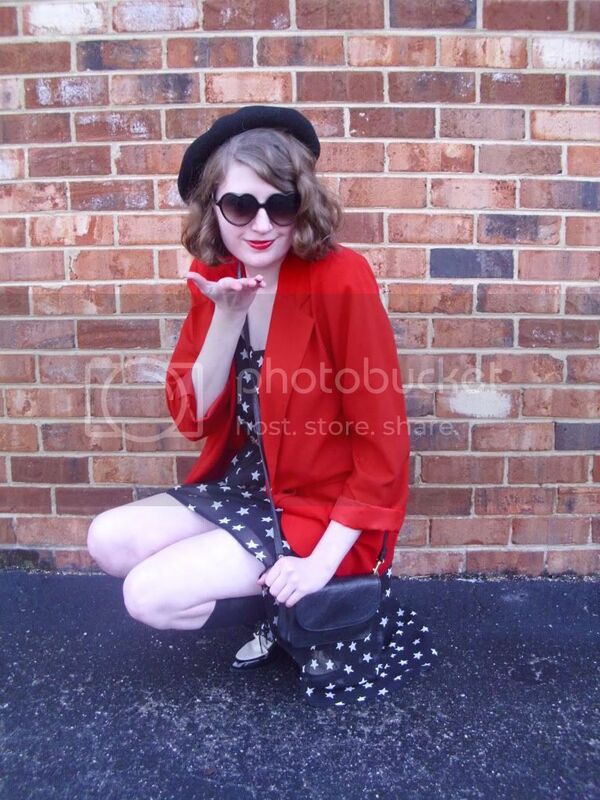 The reason that I brought up France in the first place is because of my vintage beret. To me, berets represent France and France's rich culture. So of course, I was very excited to see this beret wrapped up under my Christmas tree. 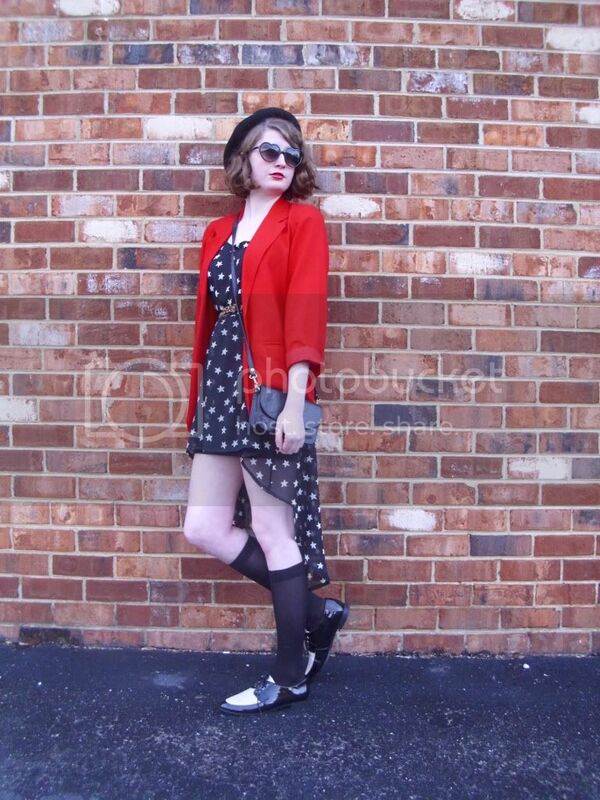 I styled the beret with a star print dress and bold, red blazer. To add my personality to the look, I snatched a leopard print belt from my wardrobe. My saddle shoes were also a Christmas gift. 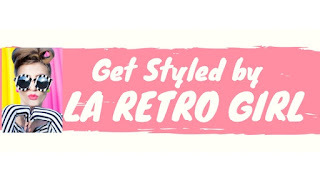 They are so retro-modern chic! I paired them with a pair of black trouser socks. Tights probably would have kept me warmer but I have been slacking off on washing my tights (I hand-wash my tights and it can be very tedious). 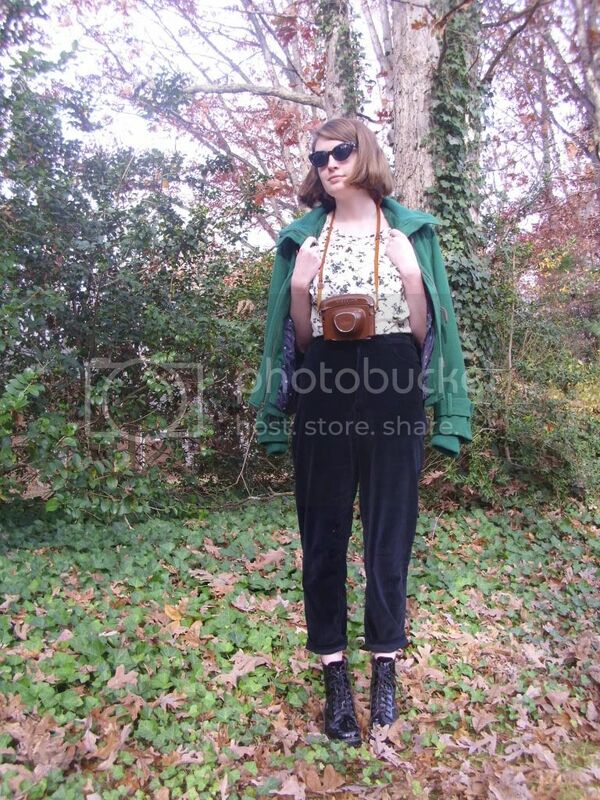 I accessorized with adorable heart sunglasses and a cross-body bag. Red lipstick added an extra punch of style to my look. Hello! I just thought that I would show you some of my favorite gifts that I received for Christmas this year. I can't wait to start wearing/using them all! 1. Dolce Vita saddle shoes. Love the retro vibe about them! 2. 100 Years of Fashion and The World's Top Fashion Blogs. Looks like I will be spending a lot of time cuddling up with a good book this winter break! 4. Rhinestone collar. Heck yes! 6. Leather GUESS backpack. 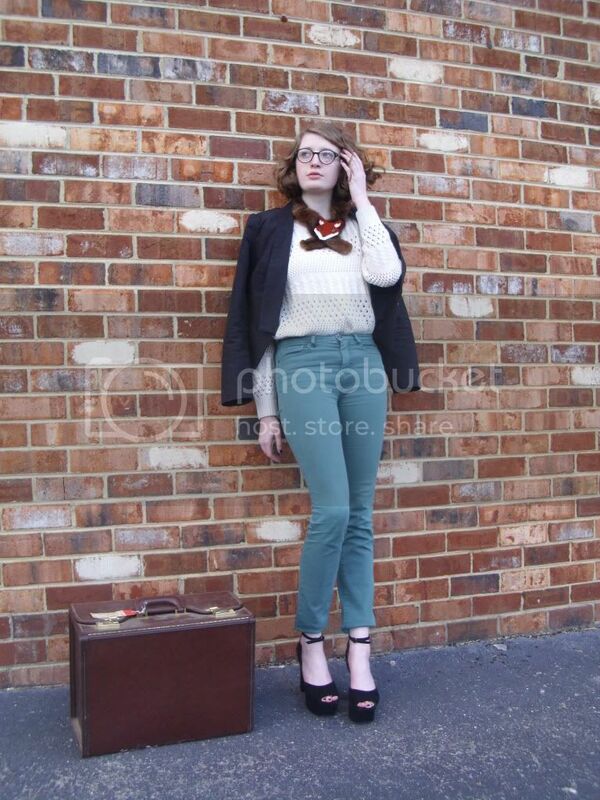 Looks like my UO faux leather backpack will have to move over and make room for this vintage backpack. 8. Assorted knit berets. Oh la la! 9. Hair chalk in pink, purple, blue and green. Need to test this out ASAP. 10. Snakeskin print bandeau. All I can say is "yes." Just "yes." 11. Book on polaroids. I find polaroids immensely intriguing! 12. Black glittery contact case. So much prettier than my current contact case. 13. UO jeans. Both high-rise BDG, one if maroon and one in black. Love these! What were some of your favorite gifts this year? Hello! I am working at Justice today from 1-7:30 so I am trying to sneak a post in before work. This is what I wore for a day spent working. I settled for jeans today due to the dropping temperatures with a low of 32 degrees. 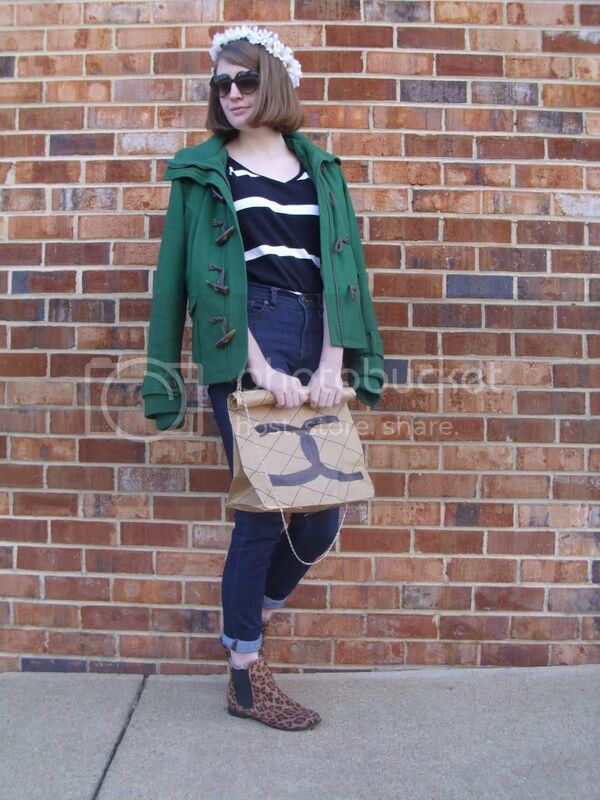 My jeans were styled with a simple, striped top and a cozy, green jacket. The color of this jacket has me falling head over heels in love with it. Besides maroon, this is my favorite fall/winter color. Leopard print boots were also added to the look because if you know me then you know that I have a desire for anything leopard print. 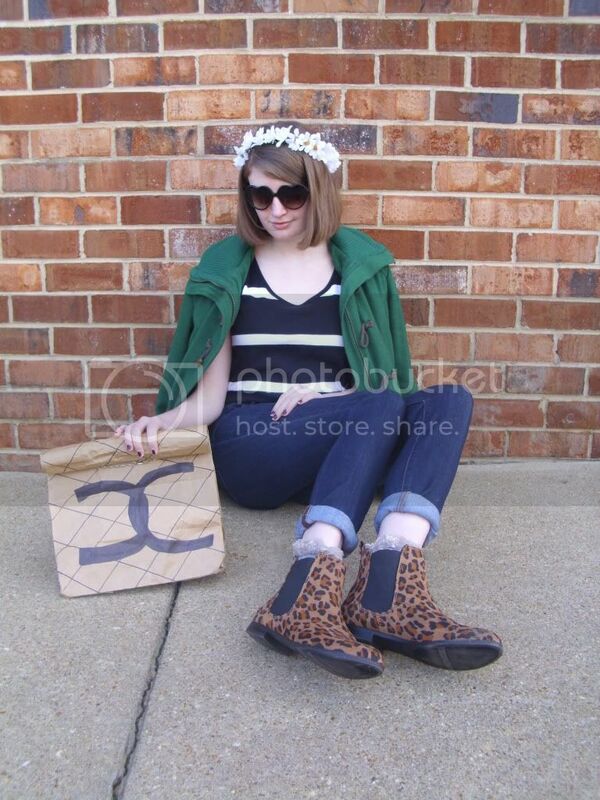 I gave the look a "cutesy" vibe with little lacy socks that peek out from my boots, heart sunglasses and a daisy crown. Yes, the daisy crown is back! It has been a few months since this daisy crown has been perched on my head but it has once again resurfaced. I have no ability to resist this lovely crown. It is possibly one of my favorite DIY's ever. You can check out my DIY tutorial for it HERE. 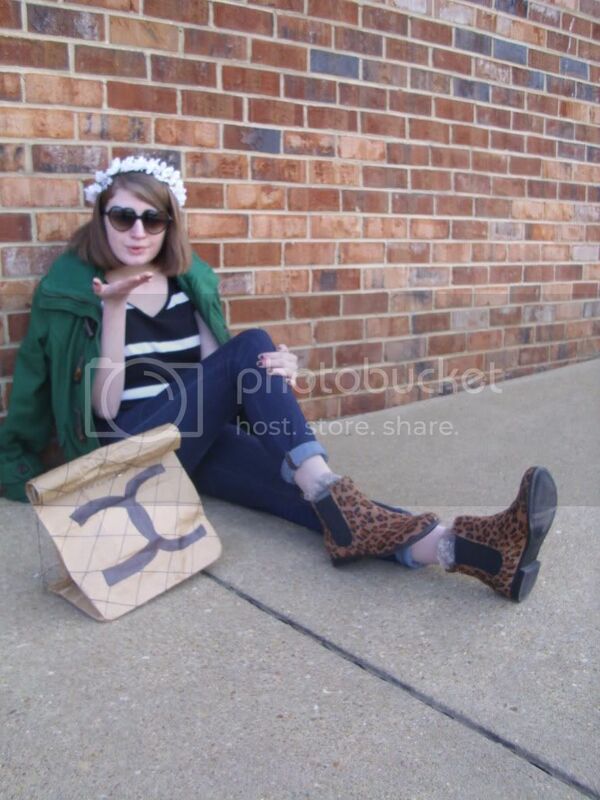 However, I am also partial to this faux Chanel DIY paper bag. Yay for knockoffs! You can check out my DIY tutorial for that HERE. Less than a week until Christmas, we’re all dreaming of what might be inside the beautifully wrapped presents under the tree come Christmas morning. 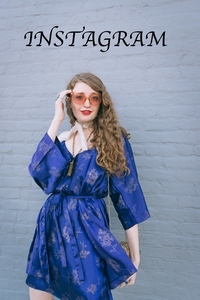 This week’s collection of posts have a festive feel but will also inspire your crafty side this holiday season, how to recycle your summer wardrobe for colder weather, last minute gift guides for loved ones, or yourself and top tips on how to shop better particularly as the post-Christmas sales begin. So, whilst you enjoy all of the wonderful contributions this week, all that remains is to wish you a very Merry Christmas and a Happy New Year. Lover of Clothes: How do you transition your summer pieces into winter weather? Youth Savage: Has the Future of Fashion Blogging Arrived? Hello! 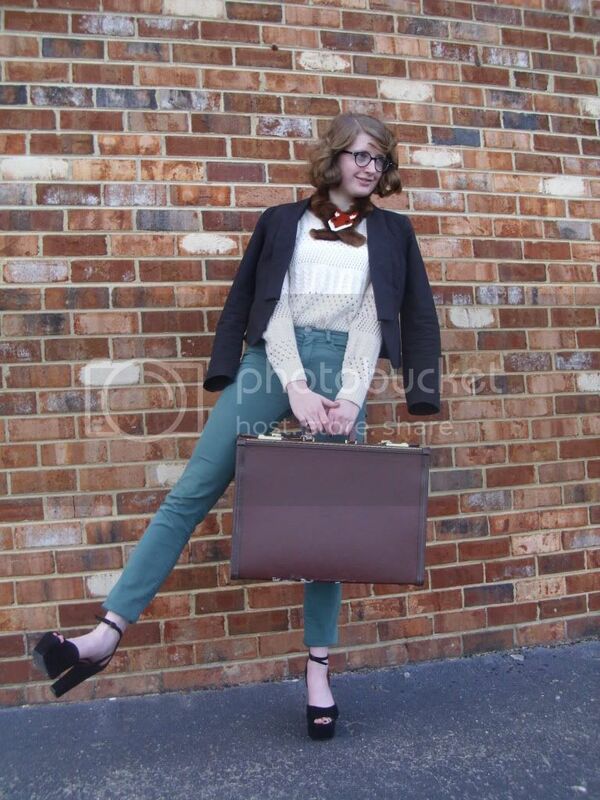 Today I wore a vintage-inspired look. 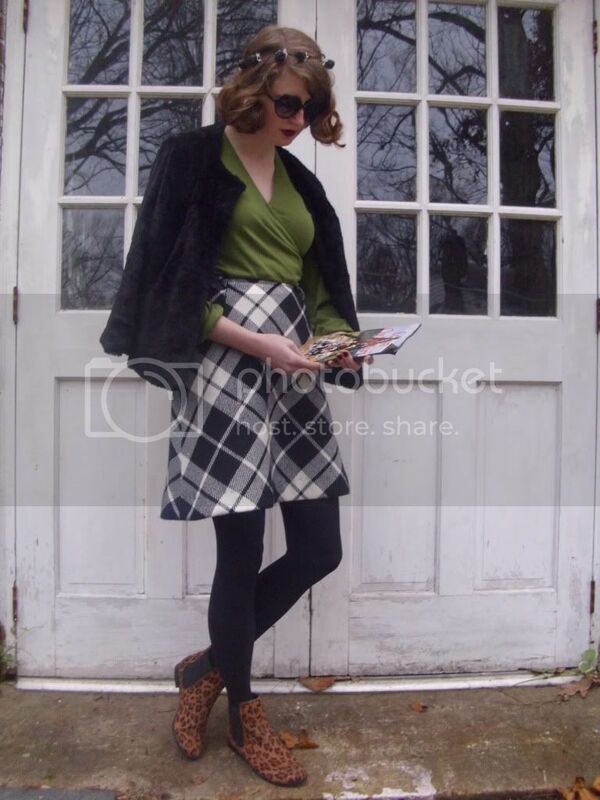 This skirt is one of the best vintage pieces in my wardrobe. It was passed down to me by my grandmother (great grandmother even, maybe?). 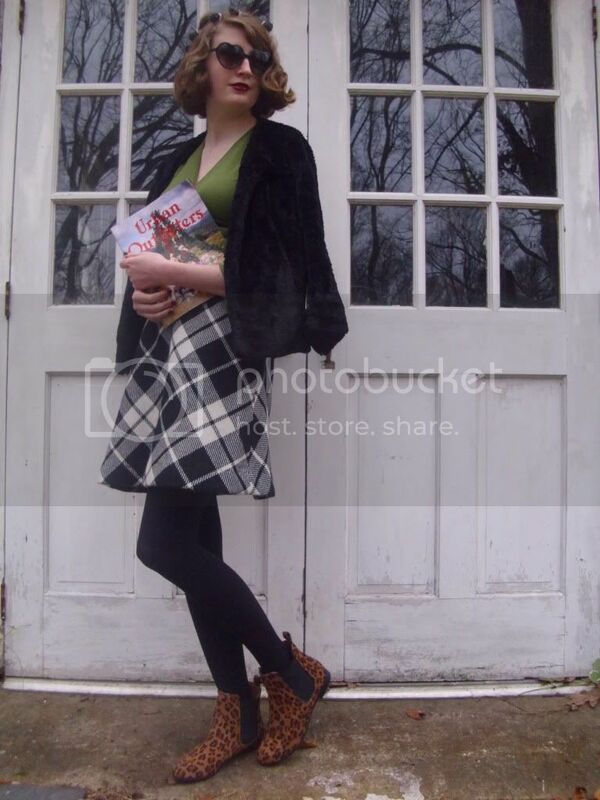 In addition to keeping me super warm, it is a very stylish, versatile skirt. There are so many different colors and prints that look good with it. A pop of green from my shirt complemented the skirt today. I layered on a faux fur jacket that practically screams vintage although I purchased it on the sales rack at Forever 21 last fall. It was a steal at $10! 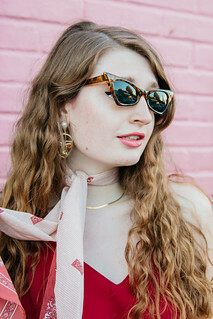 I added a bit of whimsy to my look with these heart sunglasses and this DIY blackberry headband. 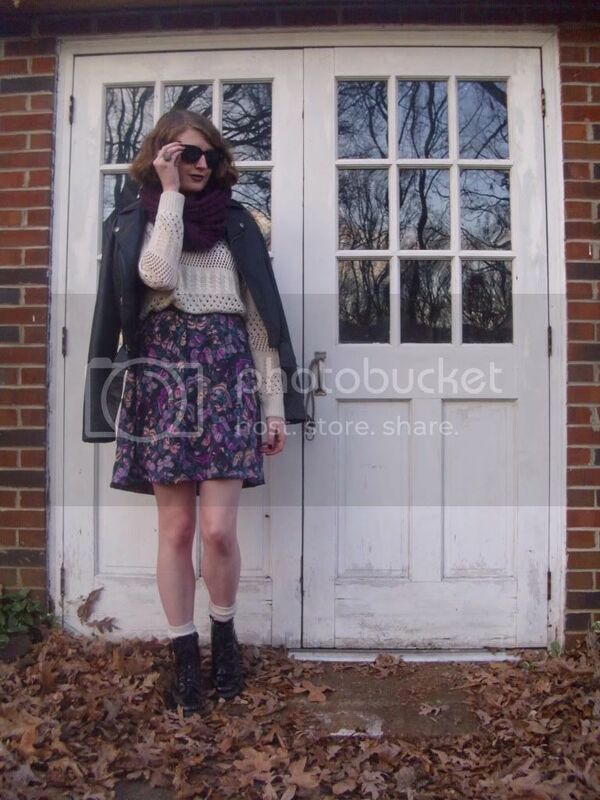 Opaque tights from Urban Outfitters (almost) kept my legs from freezing. 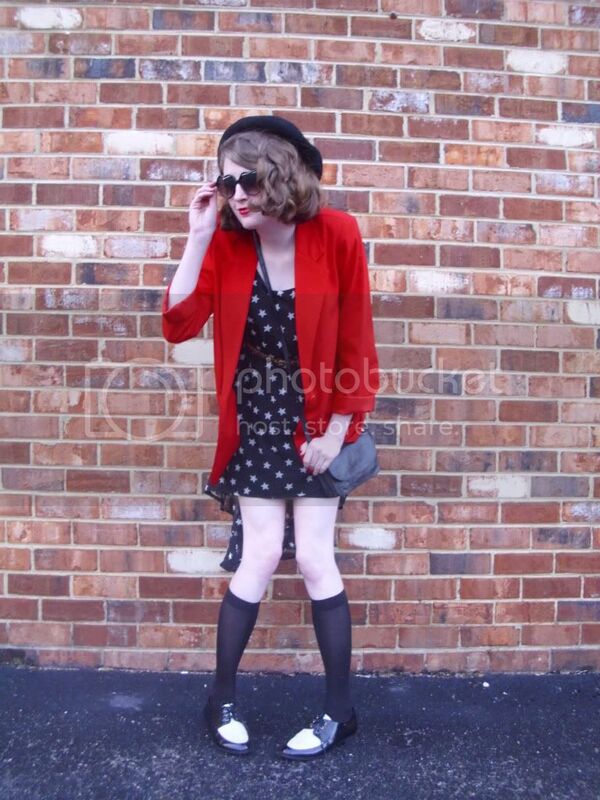 Berry lipstick and leopard print Chelsea-style booties also accompanied my ensemble. Yes, you are seeing my shoes and reading the sentence above correctly. Leopard print Chelsea-style booties are now in my possession! I don't know if you remember my holiday wishlist from last week (If not you can check it out HERE) but these precious little booties were on the list. I mean they are boots and leopard print- could they be more perfect for me? Anyway, my grandparents were in town last week and gave them to me as an early Christmas present. I just love them so much! They have already been worn a couple of times and I predict a long winter of wear from them. 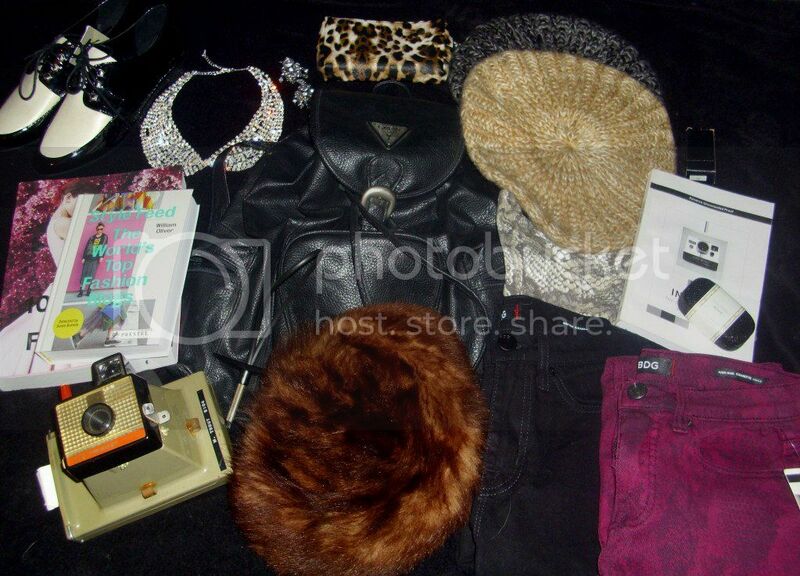 As you can see in the photos and as I mentioned earlier, I wore my blackberry headband today. It was amusing that I chose to wear it today because in my AP English class, we did a timed writing on poetry analysis. And what was the poem that we analyzed? "Picking Blackberries" by Seamus Heanley. It literally represented how the speaker enjoyed to pick blackberries in the summer and was disappointed when the blackberries would rot at the end of the summer. There were a million different themes that we could have grasped from the poem but I chose to write about how the writer was conveying how all good things must come to an end. I just thought that it was amusing because as we wrote about the poem, a replica of the subject of the poem sat on my head. Hope that you guys are having a good week! Hello! Today I have a holiday inspired DIY for you guys. A DIY "HO, HO, HO" Christmas tree ornament. It is perfect for hanging up on your tree or giving it to a friend or family member to hang up on their tree. The best thing about this DIY is that not only is it super cute, it is also very affordable and environmentally friendly. So you save money and the earth when you make this ornament instead of buying one at a store. Can it get much better than that? Level of difficulty: Easy to medium difficulty. You must be able to hand sew/ embroider. Supplies: Old pair of tights, embroidery floss, needle, scissors and lace trim. Cost: This DIY cost me nothing because I used supplies that I already had. This was a great use for a pair of tights that were too small for me. I also used lace trim and embroidery floss that I had leftover from a previous DIY. Time: This DIY is not super quick. The amount of time that this DIY takes you depends on the size of your ornament and how quickly you sew. I would estimate that for most people, this DIY would take between 30 minutes to an hour. 2. Cut two circular pieces of the same size out from your old pair of tights. 3. Thread your needle with embroidery floss. 4. Embroider/ sew on "HO, HO, HO." 5. Sew the two circular pieces together 3/4 of the way around. 6. Stuff the inside with with either fabric from your tights (what I used) or with stuffing. 7. Continue sewing all the way around. 8. Sew on lace trim. 9. 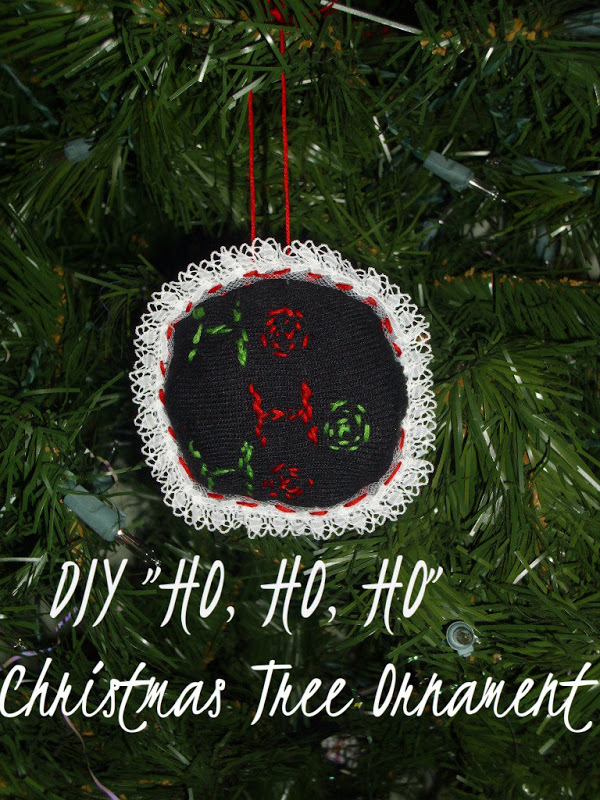 Sew on a piece of ribbon or embroidery floss to use to hang the ornament up. 10. Et voila! A new ornament for your tree. **You can use felt instead of an old pair of tights if you prefer. However, this is a great use for old tights and by re-using your tights instead of throwing them out, you are helping to protect the environment. 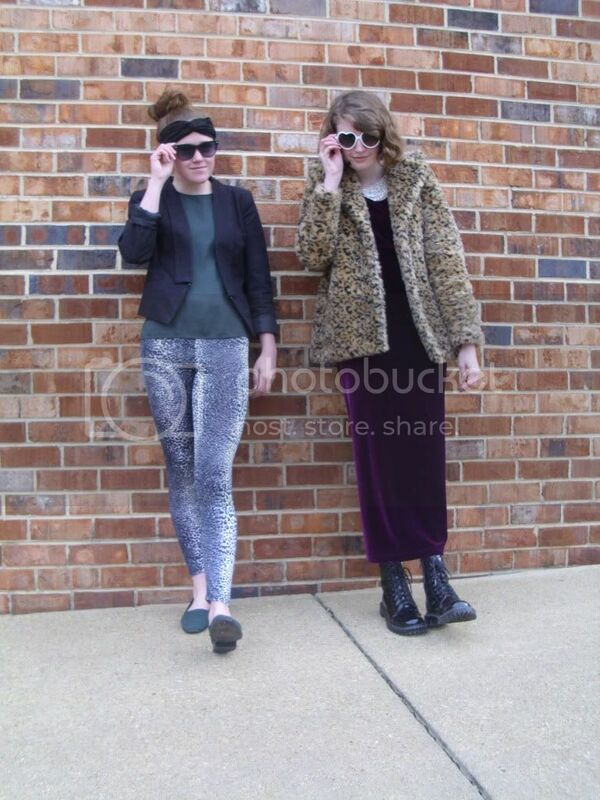 Outfit #1: Patterned dress+ velvet pants+ boots+ colored coat+ sunglasses. A great way to get more wear out of patterned dresses is to tuck them into pants and wear them as shirts. 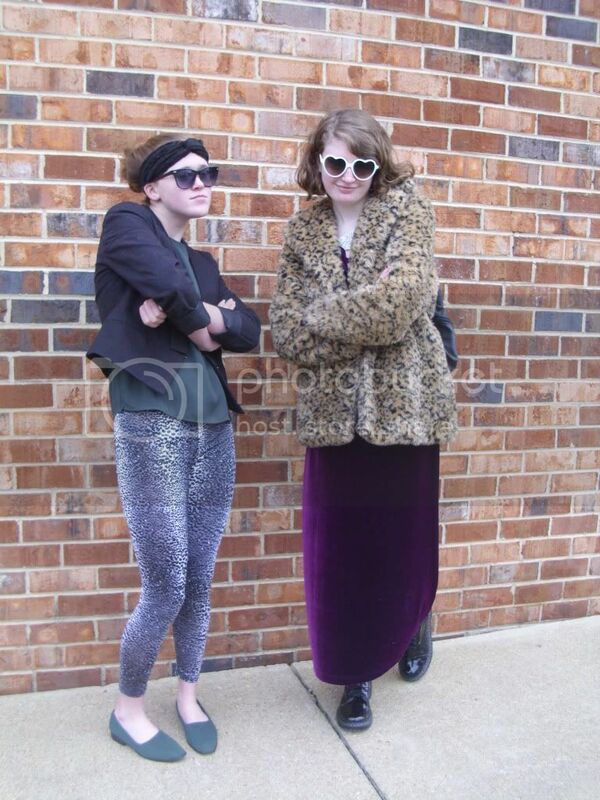 I paired mine underneath a pair of black, velvet pants. The texture of these pants creates a great, luxurious vibe. 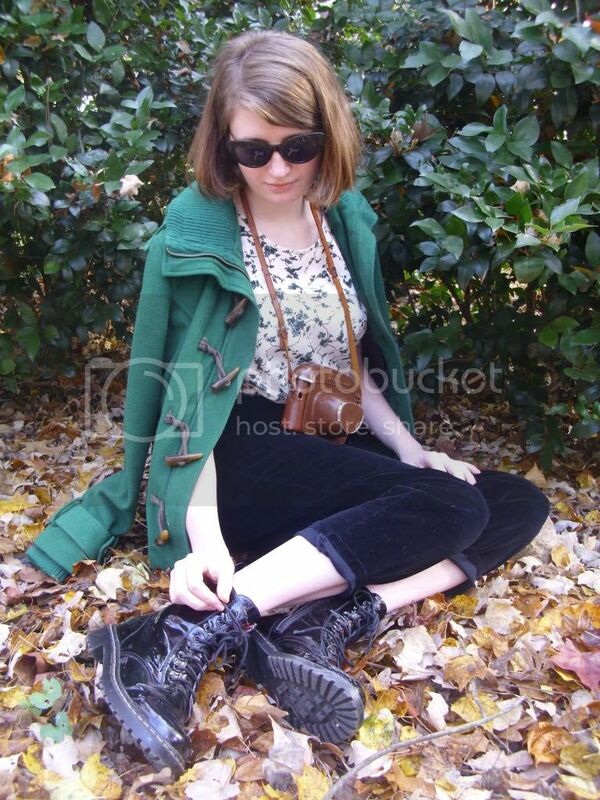 I threw on a colored coat to keep warm and a pair of combat boots to add a bit of edge to the look. 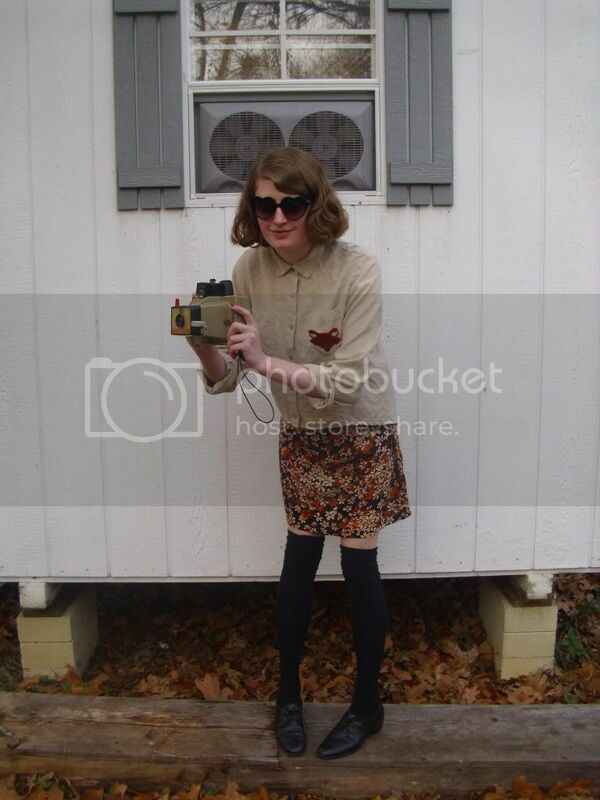 Cat eye sunglasses and a camera case finished off my look. This outfit is perfect for days spent shopping or relaxing at home. 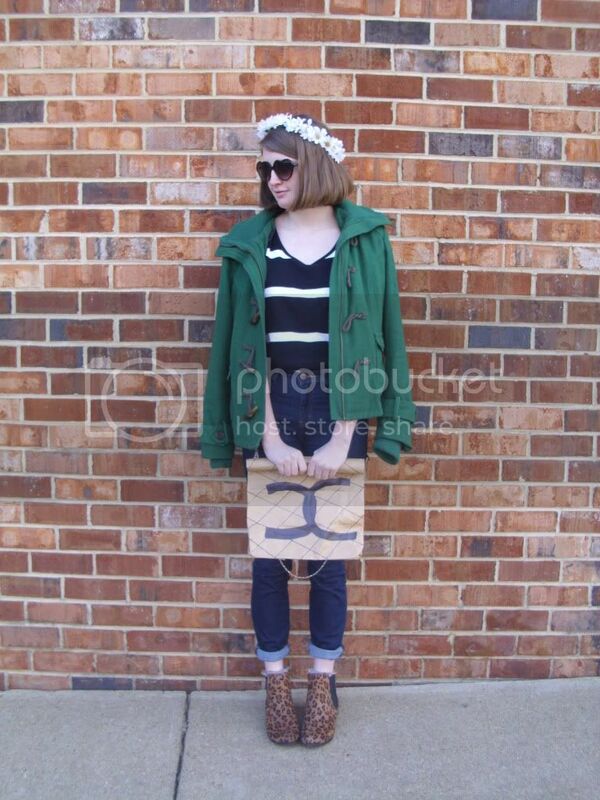 Outfit #2: Patterned dress+ solid colored blouse+ knit duster sweater+ cozy scarf+ sunglasses. 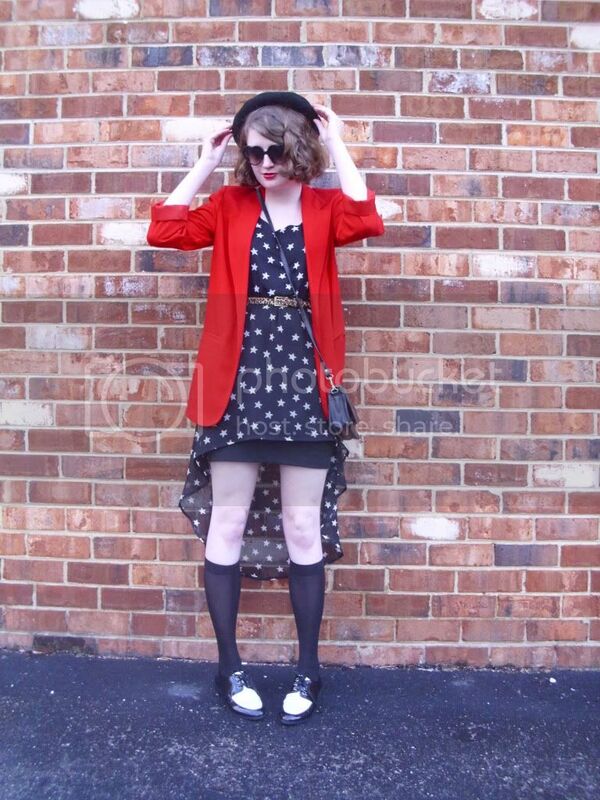 Outfit #3: Patterned dress+ colored cardigan+ colored flats+ fun tights+ sunglasses. Of course, you can always wear your dress as a dress. 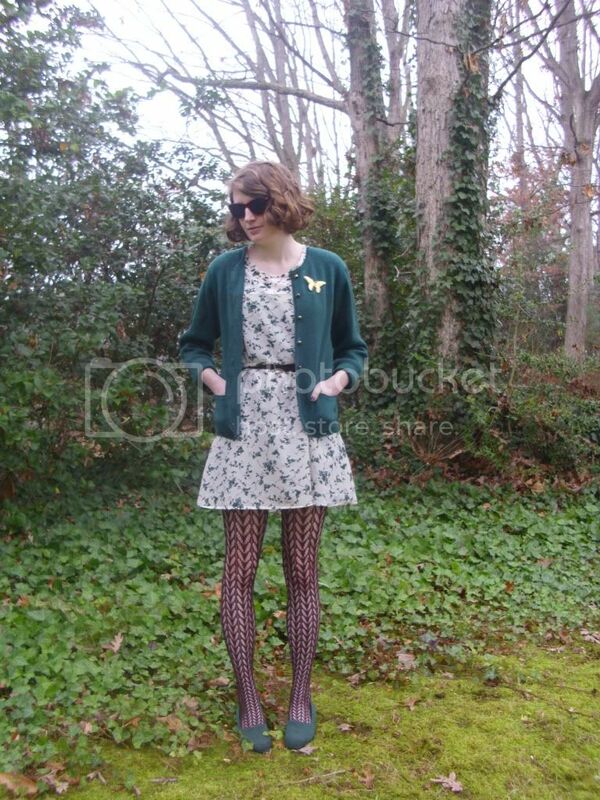 One way to wear a patterned dress in the winter is to pair it with a warm sweater and tights. 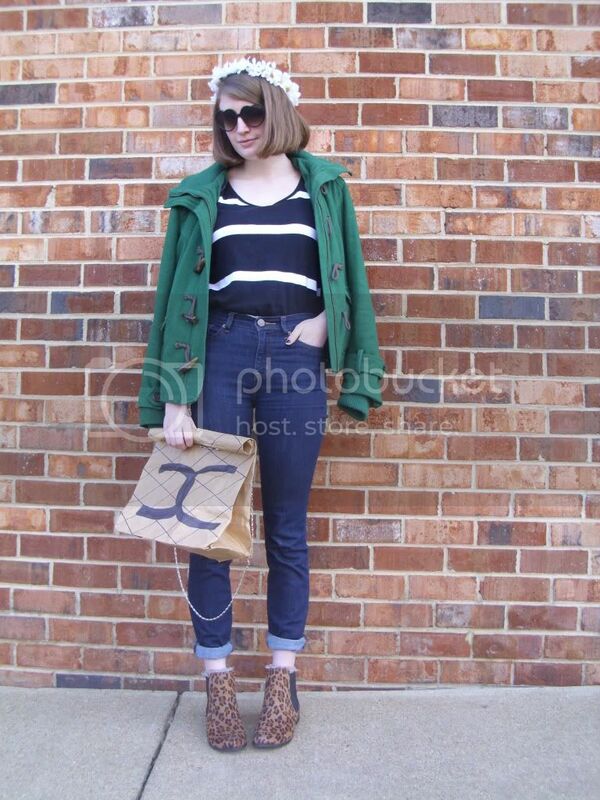 Sunglasses and simple flats were also added to the look. 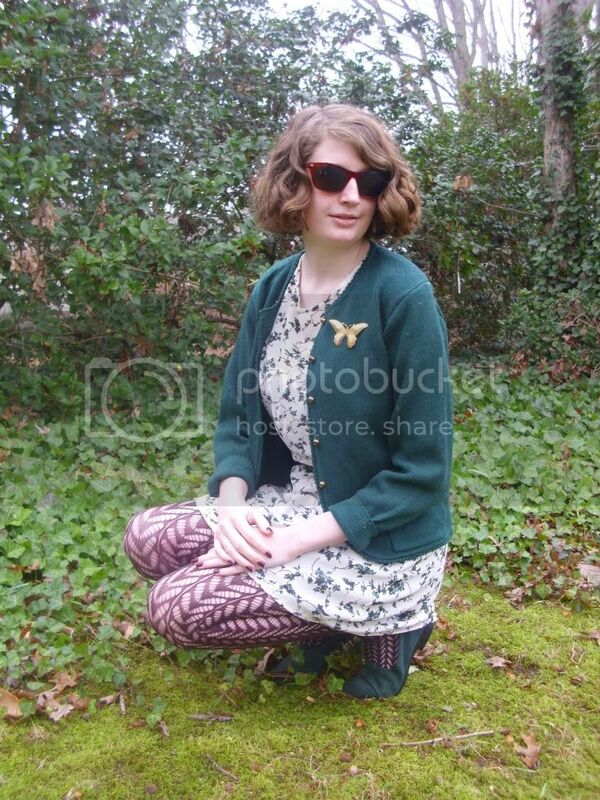 In addition, I styled a butterfly brooch with the look to give it a vintage vibe. 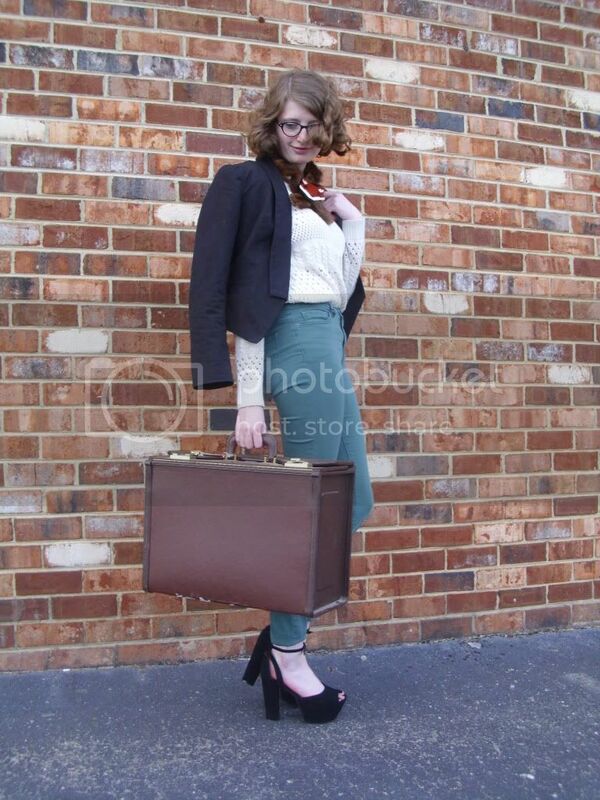 This outfit was perfect for a day spent working at Justice and would also be great for blogging or walking your dog. Hello! 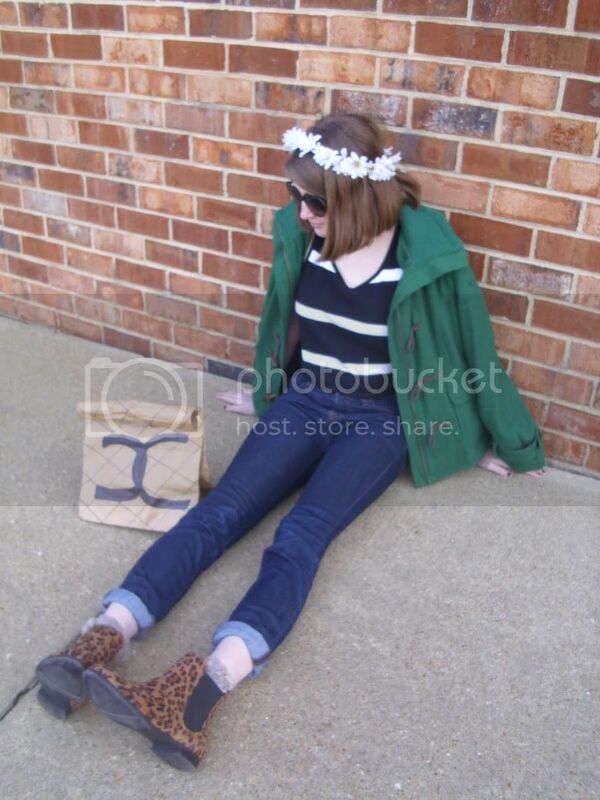 Today, I wore an outfit perfect for keeping me warm yet stylish. I planned my outfit around this butterfly print skirt. Funny story about this skirt- it originally was a dress but I outgrew the bust of the dress and decided to re-create it into a skirt. I had cut and pinned everything where it needed to be sewn a long time ago but hadn't done the actual sewing. I forgot about it and planned on wearing the skirt today. As I was putting the skirt on this morning, I realized that it still needed to be sewn and frantically sewed it before school. Luckily, I was able to finish sewing it quickly and have sufficient time to get ready! This look was all about layers; I layered a cream, knit sweater over a simple black tank and grabbed a faux leather jacket to layer over my sweater. A plum-colored, knit scarf topped all of my layers off. I grabbed a few rings and gray lipstick from my dresser to add to the look. 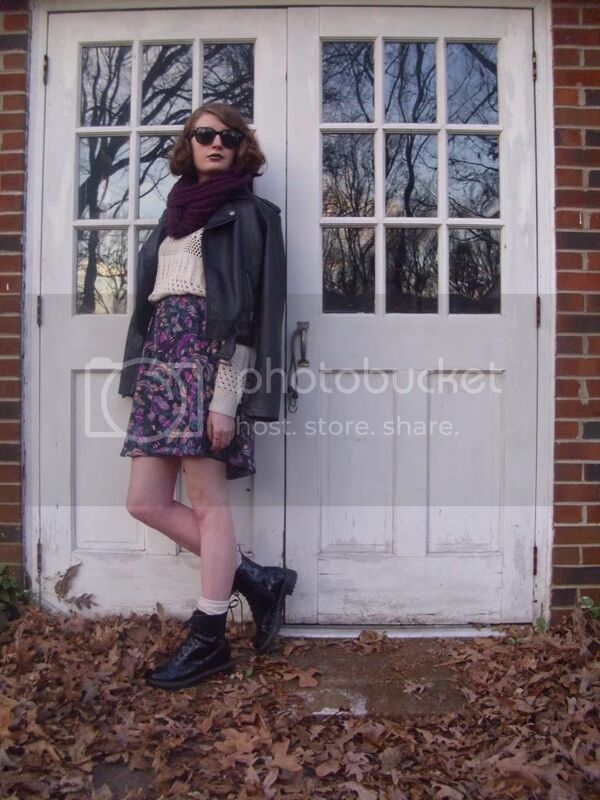 Classic sunglasses and combat boots (in addition to my faux leather jacket) added a cool vibe to my otherwise sweet look. Vintage-inspired socks tucked into my boots kept my feet nice and warm through out the day.